I am forever planning trips to exotic places in the hope of landing just one of the huge fish I dream about at night. I have been fortunate enough to have done many exotic trips and have landed some great fish, however, I have done as many trips that ended up costing serious bucks and just weren’t productive. Recently, I was reminded by Neptune that “the sea isn’t always bluer on the other side of the wave” and can now appreciate more earnestly what we have literally right on our doorstep here in Durban. There had been a couple weeks of bad water and I was frothing at the mouth to get my gills wet. I was getting so desperate to dive that I had even done a couple lone shore dives in 1m visibility just to get some exercise (that’s what I say whenever I don’t get any fish). 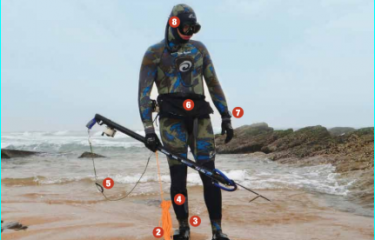 I had re-read every spearfishing magazine, re-watched every spearfishing DVD I own and had surfed every possible spearfishing site in the world. Reports started coming through early Friday that clean water had moved in along the coast and I quickly arranged to launch with my mates Dave Hancock and Chris Jones early the next morning. 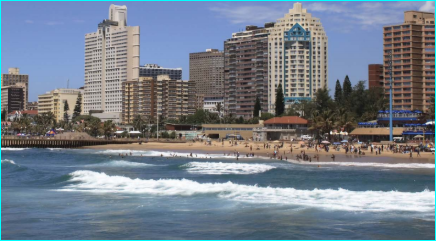 The initial plan was to launch at DUC and run north to Umhloti river mouth. Late Friday evening I heard that the vis was better in the Scotties area and the toss up was between better conditions to dive in, and the “wife admin” that would be associated with the later time returning home. After much sound reasoning (also read: I promise that the fish are so loose they are literally jumping onto spears), I managed to get the guys to agree to launch at Umkomaas. Dave and I arrived at the Umko launch site just before 5am and were greeted by a queue of boats and jet skis stretching into the main road. It was clear that the entire fishing community had also heard about the phenomenal conditions the day before. Chris finally arrived with his boat and we joined the queue to launch. It seemed as though everyone wanted to run to the Shoal as fast as possible to try and get fish before the crowds arrived. We decided to rather stay shallow and dive in relative peace before the hordes arrived after not getting anything in the deep. When we stopped at Widenham Point, the water was crystal and we could clearly see the reef 12 metres below. With the water being so clean, we decided to try the deeper reef and sounded around our marks to see if there were any showings. We didn’t see much on the finder, but with the temperature showing at 26oC, we decided to jump in anyway as the area has been previously productive for us. Dave desperately wanted a decent Couta, so I agreed to top man first and dropped him and Chris upcurrent of the mark. Not even a minute later, Chris shouts that Dave was into a nice Couta. His smile stretched from ear to ear when he dropped a beautiful fish of around 15kg into the boat. He was so chuffed that he even offered to top man right away. You have never seen anyone kit up as fast as I did – the conditions were perfect and there were fish around, and I was not going to waste a second longer sitting on the boat. We drifted for a while, taking turns to top man. Whoever was in the water was regularly seeing shoals of dart Couta coming through. With the current being very weak, we decided to anchor and all dive. I quickly set the pick and before I could get back into the water, Chris shouted that he had doubled up on 2 Fulvies. One ended up tearing off, but the other was a decent sized fish. The vis began to drop and we were seeing less and less of the darts, so we made a call to have 1 more down and then move south back into the clean water that was being pushed along. I was lying on the bottom scanning for Couta when I saw a billfish looking shape swimming in the haze towards Dave and his bomber flasher. A billfish in 18m of water? Never! It must be a shark or my overactive imagination playing tricks on me. I was in mid water on my way to the surface when I turned and saw a massive Marlin coming directly towards me. As we made eye contact, we both stopped swimming and literally just stared at each other for a couple seconds. At this point I still wasn’t sure if it was actually happening or if I was imagining it. The next thing I remember was the fish turning and my spear leaving my brand new 1.3 RA carbon reel gun. I don’t remember any actual active thought process or even having aimed at any spot in particular, my subconscious literally took over and the scene played out exactly as it had in my dreams. I didn’t see the spear hit the fish, but by the pace that it took off at, I knew that I had put in a good shot. By the time I reached the surface, the line on my gun reel was almost finished and I quickly clipped my gun onto my belt reel to give the fish another 65m of line. I was only a couple metres from the boat and shouted to Chris who was already on board to throw me a float. Chris couldn’t find any floats in the hatches – they were all in my dive bag on the deck, but in our excitement this vital bit of information was missed. The line on my belt reel was rapidly being emptied and couldn’t wait any longer for a float so I grabbed Dave’s float line that was in the water, unclipped his float and clipped it directly onto my belt reel. As I closed the clip, the float was ripped from my hands and took off northwards parallel to the coastline. I swam full pace after my float and expected the boat to follow right behind me, but when I looked back after a while I saw that the boat was still anchored in the distance. The fish had changed course and was on its way out to sea which allowed me to cut the angle and to get hold of the float before it had a chance to disappear over the horizon. I held onto the float and initially tried to fin at the same time to ensure that I didn’t cause too much pressure but my legs soon started cramping and I was content to just hang on and enjoy the ride. I was getting a little worried that I was going to be left all on my own in the middle of nowhere with an injured fish in an area that I know is full of sharks. Luckily, Dave and Chris joined me with the boat and told me that the anchor had got stuck and had to be dived out. Dave passed me another reel gun and Chris jumped into the water to swim alongside me. The thought that I had an extra set of eyes in the water was a great comfort as I could focus my attention on landing the fish and my dive buddies would handle everything else. I could feel the fish starting to slow slightly so I pulled myself up the line until I could see the Marlin swimming ahead of me a couple metres below the surface. I loaded the second gun by wrapping the original line around my arm so that both hands were free to pull back the rubbers while I was still being towed. I got a couple metres behind the fish, but I couldn’t get enough of an angle to get a decent shot at its head, as every time I got close enough it would turn slightly in the opposite direction. By now I had calmed down to a mild panic as I could see that the original spear had penetrated right through the thick body of the fish half a metre behind the head and that it was not going to pull out in a hurry. As I couldn’t get the angle on the second shot that I wanted, I tried to put the spear in just behind the gill and hopefully out through the front of the head. I placed the shot where I had wanted, but the fish turned again slightly at the last second and it came out behind the head and didn’t switch off the lights as I had hoped. What it did do was piss the fish off and cause it to steam off and take back another 50 metres of line. Over the next hour, Dave and Chris took turns in the water with me while I worked my way up the line again and again and put another 3 spears into the fish’s head. After the fifth spear, the fish regurgitated its stomach and stopped swimming. We thought that we had finally won the battle. Dave and I swam down a couple metres and grabbed the Marlin’s tail to swim it to the surface. BIG mistake, the fish must have been having a bit of a rest as it went berserk and took off again just before we got it to the surface. At this stage we had the lines of 4 reel guns trailing behind the fish and were extremely careful that neither of us got tangled as we knew that we could easily get into serious trouble. The sheer amount of spears in the fish soon did their job and the fish slowed down enough that we could keep up by swimming without having to hold onto the lines. My entire body was buggered and my legs were cramping so much that I could hardly swim so Dave took the last of our 6 guns and placed the coup de grace into the fish’s brain. It was only when I grabbed the bill and swam the fish to the surface did I truly realise the sheer size of the fish that we had just landed. Besides being absolutely exhausted, I was in a hurry to get the fish into the boat before anything arrived and decided to make a free meal of my dream catch. I had to get this onto the beach or I knew that no one would ever believe me. None of us have previously shot a fish of that size and just getting it into the 14’6 Olufson Ski Vee took some serious counter balancing that would have made a circus midget proud. While it was only just after 9am in the morning, we all had good fish in the hatch and decided to hit the beach and get home at a decent time. We got behind backline at the Umkomaas river mouth and to our horror realised that the tide had gone out and that we weren’t able to get back into the river to beach. Normally this wouldn’t be a problem, but Chris’s boat does not have the luxury of a beaching kit so we would never make it over the sandbanks, nevermind onto the beach. We almost made it over the main sandbank, but mere metres from the beach we got stuck. Well and truly stuck. It was pretty pathetic, we were literally 10 metres from the safety of the beach with over 30 scuba divers on it who stood (one guy actually climbed onto the boat’s pontoon to get a better view) and watched us get the living daylights beaten out of us by the surf as we tried to hold the nose of the boat into an oncoming set. Scuba divers, I just love them! Luckily, 2 guys on jetskis came to our rescue and helped us get the boat onto the beach safely. It has been a week since I have landed what is most definitely the fish of my lifetime and I have been reliving every second of the episode in my dreams every night. Rob Allen: you make the most AWESOME kit in the world. Who else makes spears that can drag you behind a Marlin and still not bend!